As the deep freeze that shut down campus for two and a half days begins to thaw (we think, we hope), it’s time to venture back outside. No better time for the arrival of the annual Winter Carnival, one of Lawrence University’s favorite traditions. With activities both indoors and out, the weekend is full of winter togetherness for Lawrence students, highlighted by the President’s Ball on Saturday night. 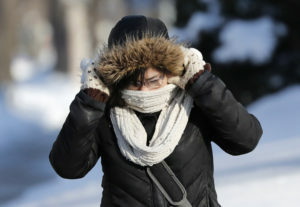 Saturday is the big day, and the forecast calls for temperatures to climb back into the 30s. Think broomball on Ormsby Lake and gingerbread building, games of all sorts and two showings of the movie “Happy Feet” (um, penguins) in the Warch Campus Center. Then it’s time to get dressed up for the President’s Ball in the Somerset Room. Winter Carnival was a tradition at Lawrence dating back decades. But it went away as the millennium neared. It roared back to life in 2011 and has been part of the Lawrence experience ever since. Check out this video from its 2011 return. 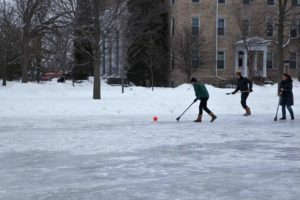 Broomball has long been part of the Winter Carnival tradition. The broomball tournament gets rolling at 10 a.m. Saturday. Teams can register here. The gingerbread house competition -– this replaces the ice sculpting of past years -– goes from 1 to 3 p.m. on the third floor of Warch. Games will be played from 1 to 3 p.m. in Mead Witter. “Happy Feet” showings are set for 8 and 11 p.m. Friday and 3 and 8 p.m. Saturday in the Warch Cinema. The President’s Ball, featuring Big Band Reunion, runs from 9 p.m. to midnight Saturday. “The big culminating event is the President’s Ball,” Carlson said. There’s live music, photos, catered food, even fondue. It’s a student event where faculty and staff are invited to attend. You can get a jump start on the fun Thursday night with the always popular Grocery Bag Bingo in Mead Witter, set for 7:30 p.m. No better celebration of winter than winning cool food prizes. We survived this week’s wind chills of 50 degrees below zero. We’ve earned a Winter Celebration.